In an era where social media influencers wield immense power over products and brands, there is no figure more influential than Kim Kardashian. The "Keeping Up With the Kardashians" star has over 113 million Instagram followers, which has given her to the power to affect trends in fashion, social media, technology and more. 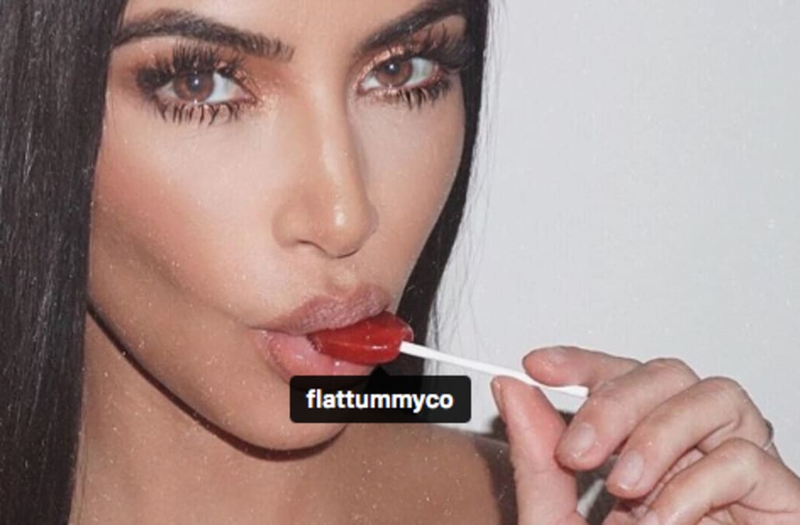 Kardashian, whose KKW Beauty brand has produced more than a few record-breaking product launches over the past year or so, is selective about what she chooses to promote on her far-reaching Instagram account. Though the star posts about her own products on a daily basis, her account is otherwise pretty devoid of #ad posts -- but not completely. "#ad Little update for you guys. I’m on Day 9 of my Shake It Baby program from @flattummyco and I’m actually feeling so good. We had a massive Christmas this year and between my Mom's party, Christmas and New Years… I felt like it was impossible to fit in my regular work outs and eat healthy. But this program is giving me a kick in the right direction that I need. These meal replacement shakes are so good and it’s helping me get my tummy back to flat in the new year. The results I’m seeing and feeling are amazing and I’m so excited for the next few weeks. Because they’re all about getting women back on track… they’ve got a 20% off sale going on right now if you want to start 2018 off right… trust me, you’re going to want to check them out." "Detoxing with @fittea 💜 it tastes amazing and the ingredients are all natural 🍵 #ad"
"#ad Enjoying my delicious @sugarbearhair gummy hair vitamins 🐻 Their holiday sale starts today - checkout their website for more details! #sugarbearhair"
"My fave phone case Lumee x Kimoji Lumee.com #lumeeambassador"
"#ad Fuelling up with my @flattummyco meal replacement shake before getting my workout done today. You guys need to do yourselves a favor and get on these Shakes because I’ve been seeing some seriously good results. I’m doing the Green Tea Matcha Shake which is part of the flat tummy bundle program. If you’re looking to give yourself a tummy makeover too, check these guys out because their 20% sale is on right now!" "Hey guys ! I have 2 exciting announcements ! We are giving 99 more of my followers up to $1000 for sharing their favorite screenshots !! Make sure to follow us on @screenshopit, to see the winners we will be announcing. The best for last - to ALL my followers - that’s right, EVERYONE - we updated our checkout experience, and are giving EVERY person a $25 FREE Gift this month with their first purchase!! 🎁 #screenshop #screenshopambassador ❤️"
"Hey guys! @LuMeeCase and I need your help to make next weekend’s film festival #Lit. They’re throwing an exclusive event in Park City and I’m so bummed I can’t make it but LuMee wants to send one of you guys in my place! Head to @LuMeeCase’s page for more details. #LumeePartnership"
"Finally found @fittea shakes for protein, fiber, and probiotics. Perfect after my workouts 💪🏼 Fit Shakes tastes amazing #ad"
"#Ad Remember this? Just want to remind all of you that if you’re miserable with #morningsickness like I was, try changing your diet & lifestyle first. If you still feel sick, don’t wait-ask your doctor about #Diclegis (doxylamine succinate & pyridoxine HCl), the only FDA-approved medication for morning sickness. It’s the most studied drug in pregnancy & it worked for me! I want to empower all moms-to-be and encourage them to speak up. #DontSufferInSilence! The most common side effect is drowsiness. Visit diclegis.com Additional safety information can be found below & at DiclegisImportantSafetyinfo.com. Duchesnay USA encourages you to report negative side effects of prescription drugs to the FDA. Visit fda.gov/medwatch or call 1-800-FDA-1088. For U.S. Residents Only. Diclegis is a prescription medicine used to treat nausea & vomiting of pregnancy in women who haven’t improved with change in diet or other non-medicine treatments. Limitation of Use: Diclegis hasn’t been studied in women with hyperemesis gravidarum. Important Safety Information Do not take Diclegis if you’re allergic to any of the ingredients in Diclegis. You should also not take Diclegis in combination with medicines called monoamine oxidase inhibitors, as these medicines can intensify & prolong the adverse CNS effects of Diclegis. Do not drive, operate heavy machinery or other activities that need your full attention unless your healthcare provider says that you may do so. Do not drink alcohol or take other central nervous system depressants such as cough & cold medicines, certain pain medicines & medicines that help you sleep while you take Diclegis. Severe drowsiness can happen or become worse causing falls or accidents. It is not known if Diclegis is safe & effective in children under 18 years of age. Keep Diclegis & all medicines out of the reach of children. Tell your healthcare provider about all of your medical conditions, including if you’re breastfeeding or plan to breastfeed. Diclegis can pass into your breast milk & may harm your baby. You shouldn’t breastfeed while using Diclegis." "@AtkinsInsider and @Chefd teamed up to bring fresh #Atkins recipes to your door! Use KIMK15 for 15% off at chefd.com. I'm making my fav, Italian Chicken Cacciatore! #GetChefd #ad"